Two days after the Toll Bridge Program Oversight Committee announced that the new $2.6 billion eastern span of the Bay Bridge would not open on Labor Day as scheduled – and possibly not until the earliest December due to widespread problems with bolt shearing – an independent review panel has suggested an interim fix that just might allow the span to open on schedule. 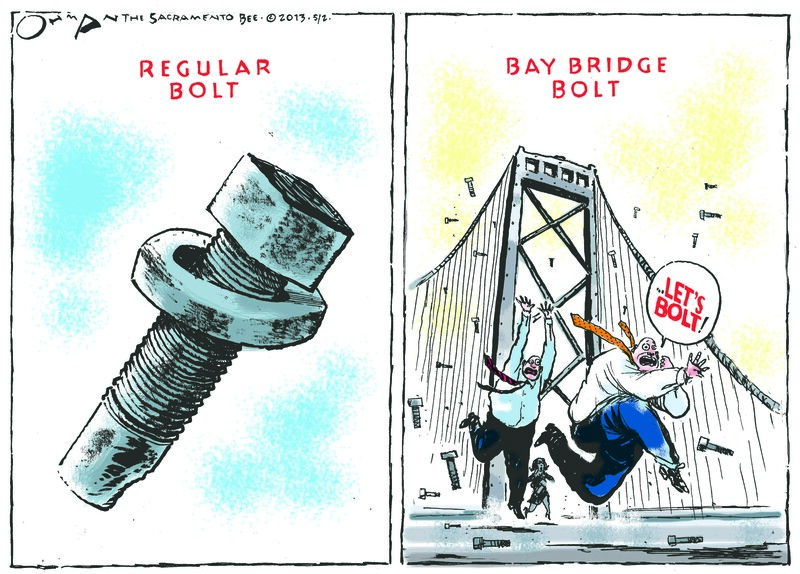 In March, officials discovered that 32 of 96 bolts used to attach a pair of seismic devices known as shear keys to the bridge broke when tightened. Shear keys are one of two types of seismic safety devices used on that section of the bridge. The other device – bearings – allow the bridge decks to move slightly while shear keys prevent them from moving too much. The interim fix calls for installing steel plates – shims – in gaps between bearings to prevent them from swiveling. You can be sure there’ll be more to come.